GRILL DIRECTIONS: Heat grill. In medium bowl, combine all salsa ingredients; mix well. Set aside. Cut 12-inch-square piece of heavy-duty foil; pierce several holes in foil. In small bowl, combine oil and lime juice; mix well. When ready to grill, brush fish with oil mixture. Place foil on gas grill over medium heat or on charcoal grill 4 to 6 inches from medium coals. Place fish fillets on foil. Cook 6 to 7 minutes or until fish flakes easily with fork, turning once. Serve salsa over grilled fish. To broil, place food on broiler pan and broil 4 to 6 inches from heat using times provided above as a guide. Fish cooks very quickly on the grill, so watch it closely or it will overcook and become tough. When fish is done, it flakes easily when touched with a fork. 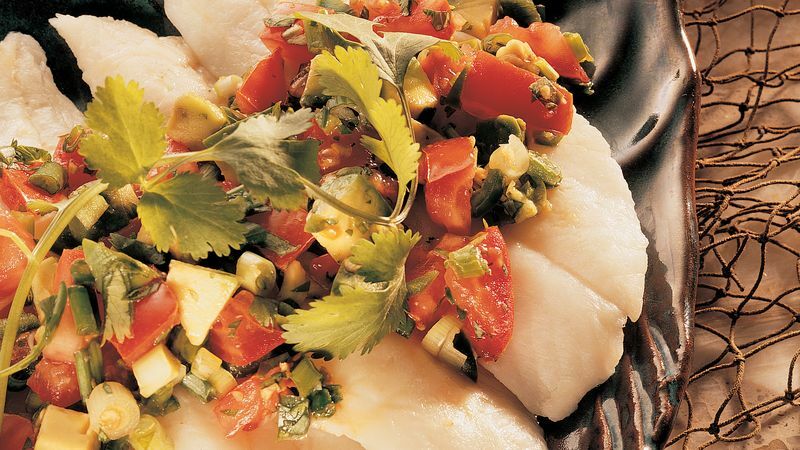 Instead of orange roughy, try any mild flavored white fish in this recipe such as flounder, sole or pike. Fish is a great source of protein and is low in fat.